Formation tanks cools the batteries during their formation, allowing to introduce more charge current to form the batteries in shorter time. Formation tank is made of stainless steel AISI 316L and supported by frame made of stainless steel AISI 316L. Sizes of formation tank depends to needs of Customer (dimensions of firm, capacity of tank, etc.). 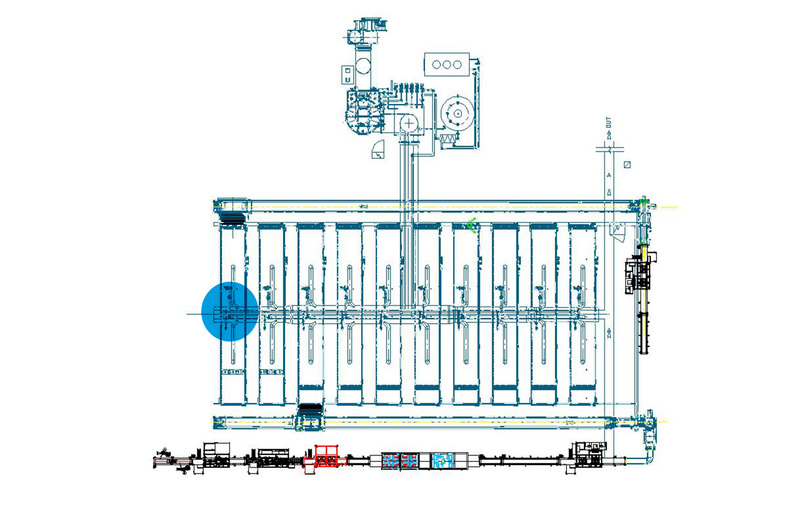 Tank are normally equipped with closing doors to vertical running, moved by oil pressure cylinder. Inside the tank is installed a transport (that it can be free rolls, in this case the loading/unloading of tanks are manually, or motorized transport, in this case the loading/unloading of tanks are completely automatic). Over formation tank a suction hood is installed for suction of gases generated during the formation process. Suction hood has the same sizes of tank and it is made of stainless steel and polycarbonate and supported by frame made of stainless steel AISI 316L. Generally formation tank has a pneumatic level control with analogic output that allows to set different heights of water during the working cycle in order to type of battery in process, selectable by operator interface panel. Besides formation tank has a recirculation pump that circulates the water inside the tank to homogenize the temperature in all zones and send s the water to store reservoirs when the water is hot .